Say Hello to Ruffles Cheese! These are the authentic Ruffles Queso chips by Sabritas. Rufles. Ruffles are a delicious snack and are perfect for parties! Its cheesy flavor is so intense and irresistible no one can eat just one! Ingredients: Potatoes, vegetable oil, queso seasoning (salt, whey, maltodextrin, whey protein concentrate, monosodium glutamate, cheddar cheese, natural flavor, citric acid, spices, yeast extract, sunflower oil, blue cheese, gum arabic, onion powder, buttermilk, paprika extracts, sour cream, butter, lactic acid, garlic powder, corn syrup solids, skim milk and annatto extracts). 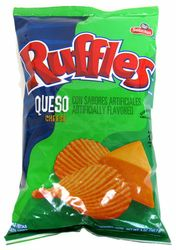 Dile Hola a Ruffles queso! Las papitas autenticas de Ruffles queso por Sabritas son una deliciosa botana para tus fiestas o para comerla en cualquier momento. Su sabor a queso es tan intenso e irresistible, que no puedes comer solo una! These chips are some of my husband's favorite. He loved them, I wish these snacks were available here in Maine. These have been a long time favorite, only down side is that they don't sell them up in Alaska. I definitely recommend! Happened upon this chips, loved them so much i figured out how to order them online! I have been a fan of Ruffles Queso chips for several years. I have to order them from Mexgrocer because they are not marketed anywhere in at least 50 miles. Thanks, Mexgrocer! I bought these chips at a Walmart in eastern NC. They were awesome! When I went back for more I couldn't find them. Unfortunately, the local store stopped carrying them. I've tried the store brand Queso chips, but needless to say, they do not compare. I hope they bring them back soon! I found this item when I was in Texas and when I came home to the eastcoast (PA) I can not find them at all. When r they coming to the east coast. Our favorite in this family! It goes like fresh hot bread. we fight for the last chip! This is actually queso no like other chips.My family loves them we order 4 bags a month for our weekly movie night. you got to try them! I was very upset to find a mistake had been made in a order I received from Mexgrocer.com. A bag of Ruffles Queso Potato Chips by Sabritas had been accidentally substituted for another item I'd ordered. Well, since I had gotten them, I decided I might as well go ahead and try them. And... WOW!!! These chips are absolutely delicious! I will be sure to have a few bags of these chips included in my next order. Try them, I'm sure you'll like them. They're really that good. these are the best chips.my 5 year old daughter and i absolutely love them. every time i see them in the store, i buy all of them. they are hard to find in kissimmee area. These chips are good, a little salty though. These chips are amazing! Everytime I travel out of the Country I stock up. I was very excited to find these on here! They taste great and the site also ships fast! These chips are fabulous if you like a cheesy chip.